And for once the camera was aimed at Jacques, without him being aware of it. 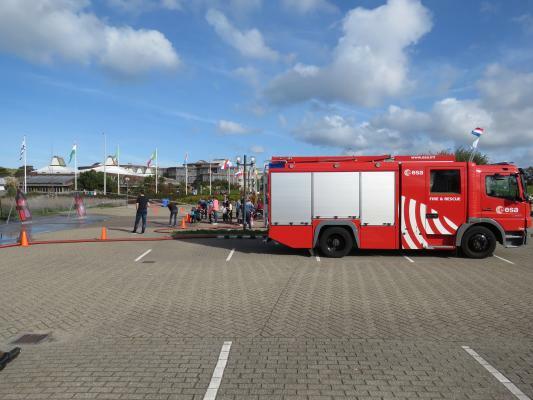 ESTEC has its own fire engine. 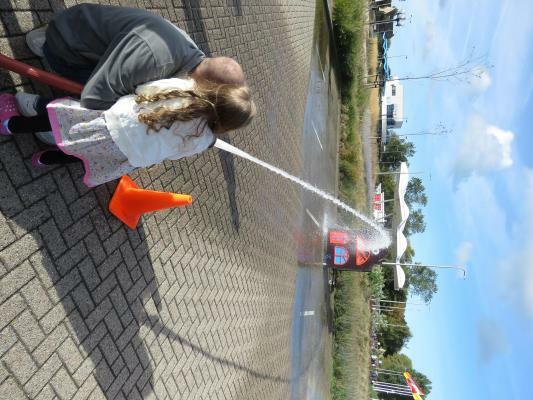 And it had its hoses out to allow kids to "launch" some water at some cardboard fires. 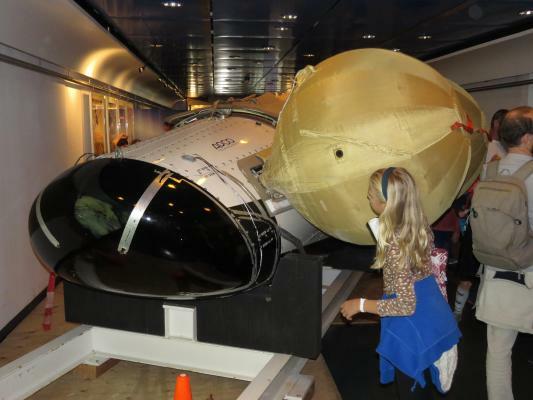 The floatation balloons of the IXV prototype were prodded and pushed by kids a couple of thousand times today. ARV is still smelling up the place at the Erasmus building. Somebody did a great job on lighting the interior. After the day had ended I had a short conversation with a guy from ESA. 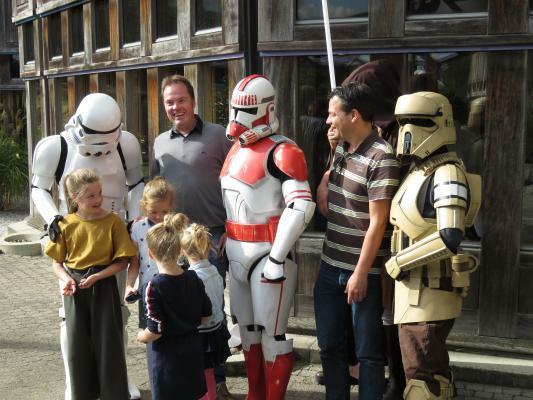 Overall this edition of the Open Day drew about 1,000 visitors less than last year. Total number of visitors was ~ 8,000. 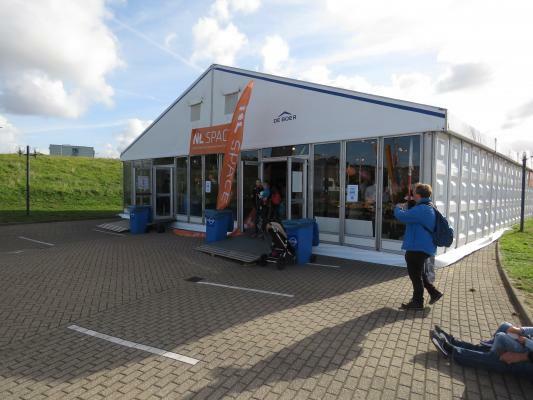 Below: the NL Space tent was situated on the parking lot of the Escape building at ESTEC. Did Steve Hogarth play anything? Marillion and related solo projects are among my very faves... Was his talk fairly well informed? I didn't attend his stage performance for I had obligations elsewhere (Erasmus building and NL Space tent). Maybe Jacques knows. It was only a talk about music and spaceflight, and how space inspired Steve with writing his songs. Also one interesting thing Andre Kuipers told was that when he arrived at ISS on his first flight... Mike Foale was there already for several months and as it turned out he (Mike Foale) is a big country music fan, and when they opened the Soyuz and ISS hatches all over the station country music was playing..
One other question was who should perform the first music gig in space... Steve's reply was "ME"
I had a great time at the ESA Open Day. 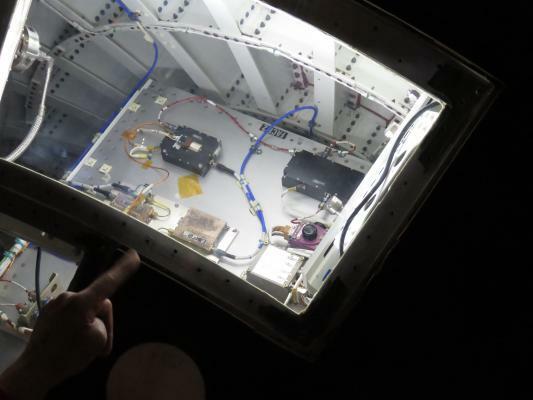 It allows you to see facilities normally not open for you and talk to engineers and scientists you don't normally meet. 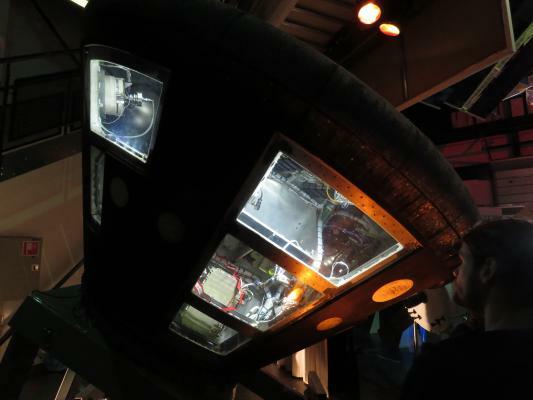 A guy from the Aeolus satellite explained why it took 10 years to launch the satellite (outgassing of materials got the laser instrument poluted, so it would not operate for the necessary 5 years lifetime). 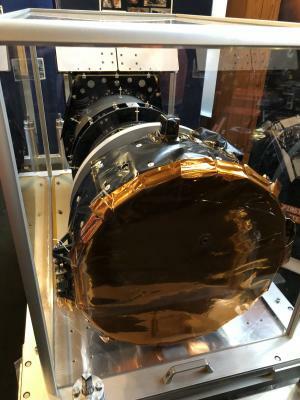 I spoke the project scientist of the CHEOPS exoplanet telescope, who told what she hopes this telescope will be able to do. 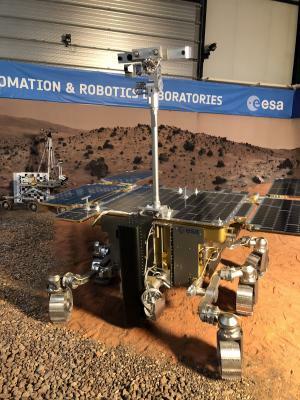 I talked a while with one of the engineers at the satellite testing center about what else they use their equipment for (it's also used for vibration tests of airplane parts and transformers). 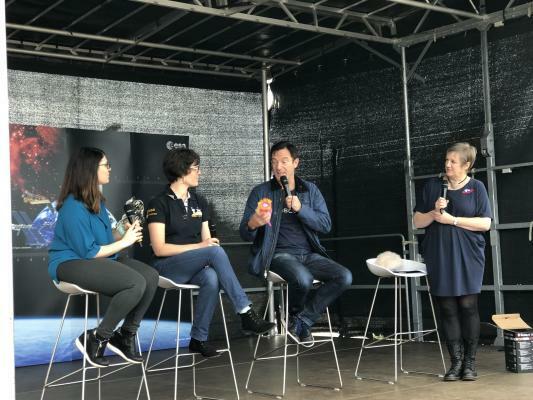 I also went to watch the interview by the people of the Space Boffins podcast, like Star Trek Discovery actor Jason Isaacs, an engineer on the Rosetta mission and an astrobiologist at ESA. Time well spend. I will go again next year. Good. Maybe we can meet up. Never mind the cost. 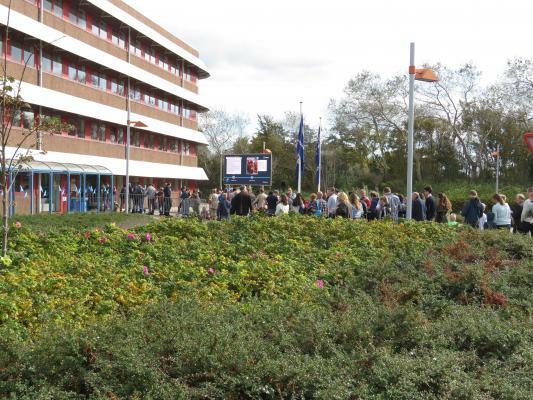 Entry is free of charge and so is parking and transfer (by bus) from the car park to the ESTEC grounds. Put something in your agenda to check ESA's Twitter account in around the end of July. There probably will be an invitation then (if this year is to go by). I wasn't aware of this event, which is a shame, or I would probably have found time to go there. Has a date been fixed yet for next year? I'll put it in my agenda! No date has been announced, but it's probably during the annual 'Weekend van de Wetenschap' (Science weekend, https://www.weekendvandewetenschap.nl/). Alexander Gerst performed "live" in concert with Kraftwerk this year from the ISS. But I suppose that was more of a guest spot than a whole gig.